You’ve seen photos, watched documentary’s about them, read the books, bought the tee-shirt, but some places just have to be experienced to feel their full impact. We travelled quite widely in China and saw some truly spectacular and wonderful sights that I will never forget, but the one that, completely and unexpectedly, blew me out of the water was the Great Wall. You might say ‘one wall is much the same as another’ believe me, it’s not. The majesty of it’s extraordinary steep sweep, like a brush stroke across the landscape, is breathtaking. Knowing it’s gruesome history makes it even more so. We visited in February, during the New Year festival (an astonishing not-to-be-missed event), it was unbelievably cold, with a biting wind blowing across. It did mean it was a beautifully clear day though, so we could see for miles. It is impossible to capture it fully in a photograph, but I was particularly pleased with this photograph of my friend Gill. I loved the way her coat is billowing out and that she looks completely alone (she wasn’t of course),and I think the photo does, just about, conveys the sense of just how bloomin’ steep it was! 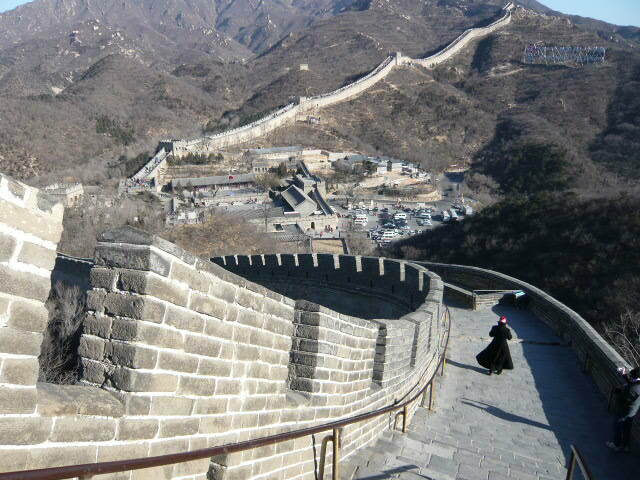 This entry was posted in China, Pics of Places and Things and tagged China, Great Wall, photo, photography, pic, travel. Bookmark the permalink.